Blogging challenges were never for me. Mostly because I don't like being told what to do/write about. And then I also feel kind of awkward spending an entire month talking about me, me, me. Who am I kidding? I love that part. Mom: I juiced this pomelo-orange-lemon-apple concoction for you. Drink it. Me: I'm going to have some juice. I ask myself the same question every single day. I actually really wanted to do this one! 01. Last night, we fit 7 people into a tiny 5-person car to go to Taco Bell. 02. Coffee shops/cafes are my favorite places in the world. but I'm never more in my element than in a Starbucks or any cafe, really. I look up & find Orion in the night sky and feel much more balanced and at peace. 01. Find a summer internship soon-ish. 02. Live in NYC when I'm young. and think: I wouldn't have lived it any other way. lol! that pic is totally a GAP ad ;) and i like looking up at the stars too... it helps me relax. 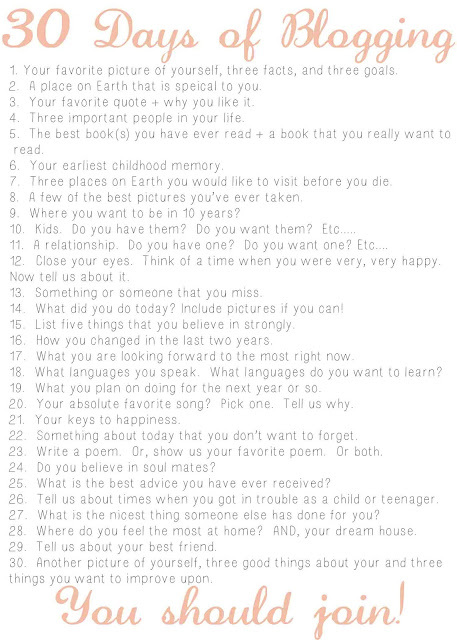 I don't really like blogging challenges but this one seems really cool! I'm looking forward to seeing all the posts and I'll definitely steal a few for inspiration and so forth. :]]] great idea! That picture is amazing! I love your goals ;) Have a lovely weekend! You look really cute... Great post! I would love to live in NYC too- but since I`m not American, I doubt it will happen! So you have to, so I can live vicariously though you please! Found your at Diary of a Brown Eyed Girl blog hop.